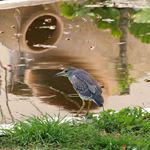 The hottest month of the year on Tenerife, but not oppressively so, just enough to enjoy feeling hot, hot, hot… as long as you don’t have to work. Everyone slows down, chills out and lives life outdoors (even more so than usual). Subsequently nearly all the events this month are open air ones. This is the month to let your hair down and dance in the sun. 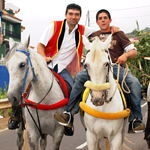 The celebration of the arrival of the black Madonna during the age of the Guanches on Tenerife sees Canarios from across the island make their way on foot to Candelaria. Up to 100,000 pilgrims pack out Candelaria during the main fiesta days. The afternoon and night of the 14th is when the romería is held and the re-enactment of the sighting of the ‘Virgen’ takes place which is a hoot. The 15th is more serious with solemn processions around the Basilica. One of the nicest romerías on Tenerife mainly because it’s in one of the prettiest towns, Garachico. Apart from that it’s the usual extravaganza of decorated carts, locals in traditional dress, lumbering oxen, goats, donkeys and lashings of food and wine. One of Tenerife’s ‘odd’ fiestas with three giant hearts made of fruit and pastries being paraded through the towns streets before they are erected outside of the church and abused by the creators of the other hearts. 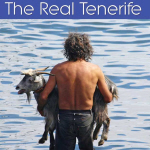 Again like most Tenerife fiestas there are other events taking place around the main day. The most popular firework show of the year in the south of Tenerife takes place off the coast of the small fishing town of Alcalá in the sunny south west. The intimate fiestas last for a few days but what everyone wants to know is ‘when do the fireworks go off?’ There seems to have been some confusion this year, partly thanks to the local council never getting decent information out in time. But it’s normally always the same date – 15 August. 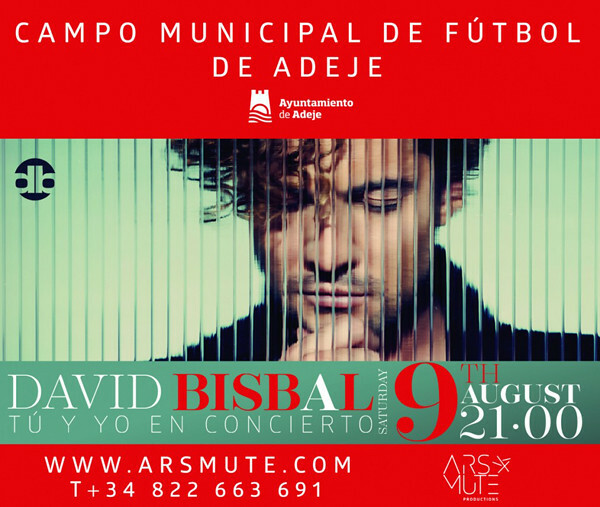 The biggest name playing the island this month might not be quite so well known to non-Spanish visitors, but amiable singer David Bisbal is absolutely huge in Spain, his face is never off Spanish TV. The big Arona summer party with 10 DJs adding more heat to the sizzling summer scene. Whipping the crowd into a dance frenzy will be Armin van Buuren, Steve Angello, Sander Van Doorn, Showtek, Julián Jordan, Brian Cross, Archip Simmelink and DJ Dario. 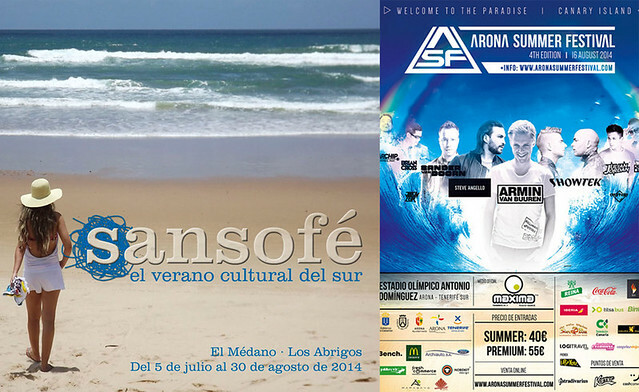 Although there are presentations and exhibitions connected with the Son Atlántico festival, most people will be interest in Limpio de Son Atlántico at the beach on the 23rd – a ten hour long surf party with music from Efecto Pasillo, Fuel Fandango, Aristides Moreno and Los Coquillos amongst others. 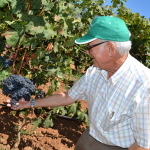 Sansofé starts in July in El Médano but the juiciest events take place in August. Highlights are the Festival of New Talent (8 and 9 August, 9pm) and the Folclórico de los Pueblos featuring traditional acts from across the world (19 to 24 Aug). There’s a lot more going on as well. 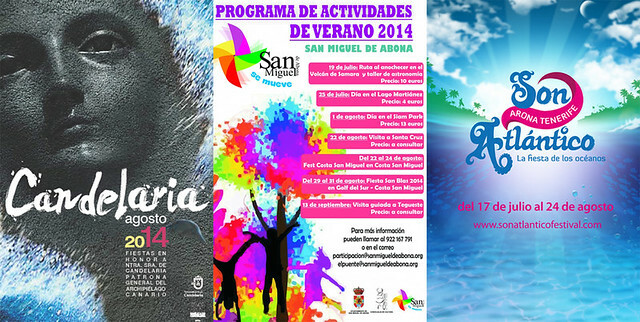 A couple of mini fests in San Miguel de Abona with folklore concerts, artisan workshops, exhibitions etc. Where they are actually taking place is a bit difficult to figure out since the council started doing a ‘Costa Adeje’ by referring to places on the coast as ‘Costa San Miguel’. The first takes place simply at Costa San Miguel whilst the second is pinned down to Golf del Sur, sometimes now also referred to as… Costa San Miguel. 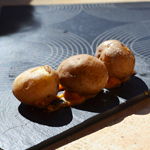 We know the biggest and best artisan fair on Tenerife is in September, but as it’s near the start of the month we thought we’d make sure you knew about it now. The best and most unique handicrafts as well as music, food stalls and kiosks and craft workshops as well as loads more. This year the theme is jewellery. Wonderful setting and a fabulous atmosphere. There are even more windsurfers than usual as the PWA rolls into town with this important World Cup event. August in El Médano is going to be a busy and buzzing month.